Dr Akinwumi Adesina, President African Development Bank (AfDB). African Development Bank (AfDB) has created 300 million US dollar financing facility to fund African women in agri-business to accelerate agriculture within the next 12 months. This is was reported by News Agency of Nigeria saying it was contained in the October Newsletter Edition of the AfDB. The AfDB President, Dr Akinwumi Adesina, was quoted as announcing the decision during the bank’s conference in Dakar with over 500 delegates, including top Government officials, Central Bank Governors and Ministers of Finance. The president said that the essence of the conference was to create an avenue to discuss on African agricultural transformation in a move to re-direct useful resources to revitalise agriculture on the continent. 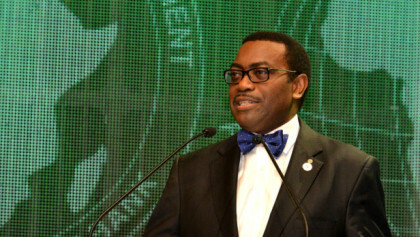 According to Adesina, the creation of 300-million US dollar financing facility is meant to channel more funds to African women in agri-business and provide bank guarantees. The president said that agricultural transformation was taking shape in some African countries which has launched initiatives to boost the provision of essential services linked to the agriculture sector. Adesina noted that the feeding Africa conference has provided a critical in-road in an effort to mechanise farming and unlock the potential. The Newsletter also quoted, Mr Oluwatosin Ariyo, who is overseeing a British government-funded initiative to improve the status of women in agriculture in rural Nigeria, said his organisation hoped to tap into the strong commitments reached at the conference. He said that the decision would go a long way to boost programmes under implementation in Nigeria. Ariyo said the conference has brought agriculture to the lamplight, adding that the financial sector would begin to close the gap that has been created in the whole value-chain. Ariyo said that the fund created by the AfDB would help to reduce interest rates on agri-business loans. According to him, the fund will enable more women to benefit.